Welcome to Boom 22, 3 month group, Later. Not exactly exciting an exciting name but accurate! Everyone in Later will be making blocks due Thursday, May 9, 2019. Details follow below but anyone who has participated in a recent Boom knows the basics. Please send me 19 F8s. Please wash your yardage, press, remove selvages, cut into F8s (approx. 18x11, no smaller than 18x10), bag in a quart-sized or smaller baggie (the smaller, the better), label with your name and any requests and then put them into a large ziplock-type envelope inside your mailing envelope with your name and address on it. Remember, you will be shipping with tracking. All fabrics must be in my hands on or before Thursday, February 7, 2019 and I will turn around and send them out on or before than Monday, February 11, 2019. If all fabrics are in earlier, I'll mail earlier. 3) Please mail your F8s to arrive by Thursday, February 7, 2019. The earlier everyone gets them to me, the earlier they go out! Be sure to send me the tracking number as soon as you ship. 6) You are required to keep in touch with your group by posting to the dedicated Boom 22 threads at least once a week. This is a requirement. If you don’t wish to keep in touch, this is not the swap for you. 19 F8's all prepped and ready for baggies. I need to get my note finished should be ready to mail Tues.
Pamela the same thing keeps running through my mind. Howdie Laters! I’m busy visiting my dear mother in California but had to stop in and sai Hi So excited to jump into everyone’s fabric and play soon! Will be back home to cut and send my F8’s by next weekend. I think you've started something here Pamela! I hadn't even thought of this until I read your post! Just finished packaging my F8s! Mailing when the PO opens up Tuesday. I hope you all were able to check out the lunar eclipse- blood moon. It was absolutely breathtaking here. It is a cold, but beautiful clear night. Hi Laters! I see you've found the thread. Yay! Thank you to everyone who has responded to my email. There are still a few more I need to hear from so if you haven't yet seen it, please check your email and reply. So our names are rather humorous. I'm glad you are having a bit of fun with them. I'd actually hoped you'd find the goofiness of them enjoyable. JayneW, I missed the blood moon, too darn tired last night, but the pix are astounding. How beautiful! Oh, well, after seeing enough pix, in a while I'll think I saw it in person anyway. So, I see you are packaging up your F8s, getting them ready to go. Reminder about size - 10x18 but 11x18 is appreciated if you've got it. Labels with your board name on every small baggie are required along with your fabric requests if you have any (remember they are requests not requirements!) should be inside or on a label on the outside. If you don't have any requests, please let us know that, too. When those are done, please put everything inside a larger, gallon-sized ziplock that has your board name, group name, as well as your address in the event that a package comes undone during shipping. It may increase chances of getting back to you. It's not happened yet but that doesn't mean it cannot. (Now there's a lesson I keep having to learn.) Remember email me with your tracking number as soon as you get it. Do not post it on the threads. And while we're at it, be cautious if you take pix. Some people have posted pix of their prepped packages and both my address and theirs have been clearly visible in the photo. Be cautious! I need to put labels on all my fabrics and they will be ready to mail. Good morning everyone! Getting my package ready today so I can mail to Janice tomorrow. 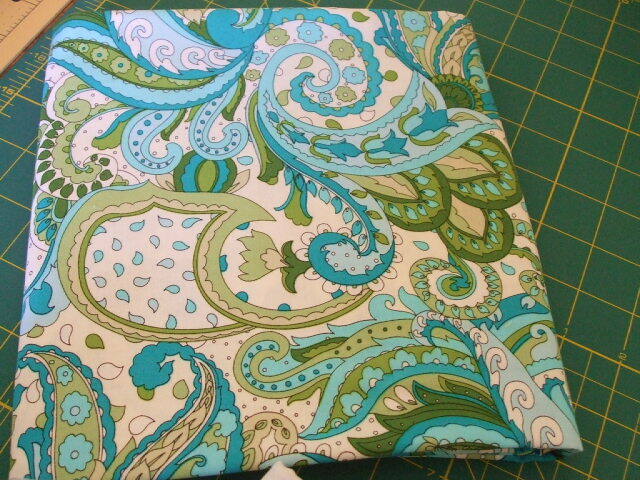 Here is a pic of the fabric for the later group, the paisley. 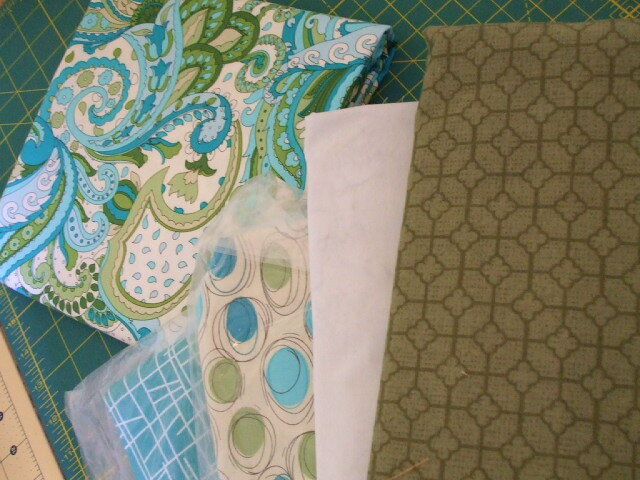 2nd pic is of the coordinating fabrics that I have to go with it. I will use the green for the sashing. I would like you to use the off white as in the background and /or a dark chocolate brown. Please use only solids or tone on tones and no other prints. I would like this print to be the start of the quilt. Janice, I wrote my name on all my bags with sharpie, is that acceptable or do you specifically want labels? Jaba - you always have such beautiful interesting fabric - love the colors. Its just a matter of time"
(And I will say that love is the love of quilting!!" Well, PamelaOry, you judge. The names need to be easily readable by the end of the swap. Sometimes marker rubs off with repeated handling and sometimes if there isn't a light fabric behind it, it becomes very difficult to read. See what you think. Be kind to my aging eyes and my sanity. TG, you win the internets today!!!! Love it!!!! Oh TG, I remember that song like it was just out yesterday! Jaba I made a quilt out of that fabric. Loved it then and love it still. Gorgeous coordinating fabrics Jaba! I bet the final grouping of blocks will be beautiful together. Check out her houndstooth dress! Howdy Laters! So glad that we are finally on a roll. I will be mailing my package on Wednesday. That is payday for me. Can't wait to get started. [QUOTE=Janice McC;8197495]Check out her houndstooth dress!